Picture Addition – What’s for Lunch? Sums to 7. 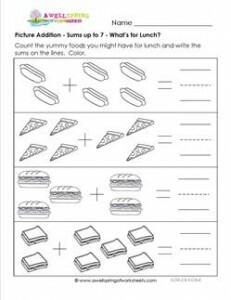 This picture addition worksheet of a hot dog, pizza, sub sandwich, and pb&j will get you thinking about what’s for your lunch! Please go to this page to see all the picture addition worksheets in this set.